This article will describe how to connect your Google Analytics account to Interact apps. Step 1: Login to your Google Analytics account and navigate to Admin section located in the bottom left sidebar. 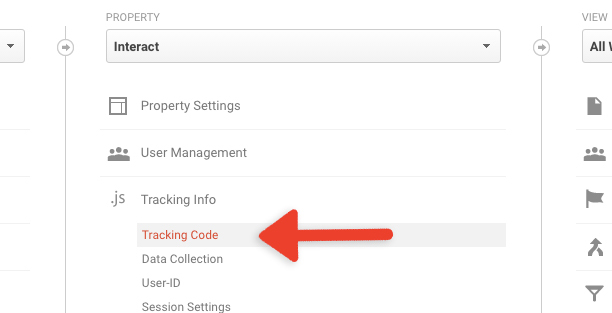 Step 2: Click Tracking Info -> Tracking Code, located in the middle column of the page. Step 3: Here you will find your Tracking ID. This is needed for the next setup steps. 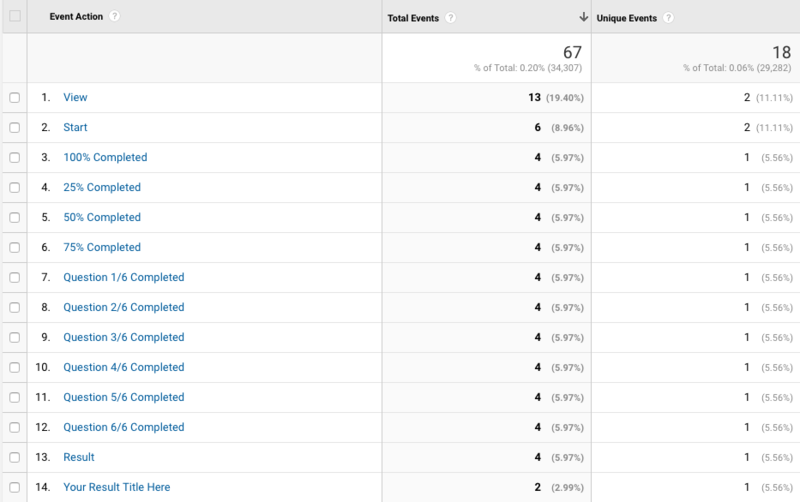 Step 1: In the Interact app builder, under Conversion Tracking, choose Google Analytics from the list of clients. Step 2: In the pop up, copy and paste your Google Analytics Tracking ID. Step 1: Login to your Google Analytics account and navigate to Behavior -> Events -> Overview section located in the left sidebar. Step 2: Under Event Category, you will see Quiz as an option. Click on it to explore further. 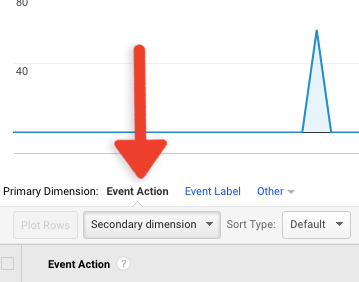 Step 3: To explore further, click Event Action under Primary Dimension to sort events by the action. Now that you can see all of the different events being sent by your Interact apps to Google Analytics you can utilize Events Overview, Events Flow, and Segmentations to gain further insight into conversions and user behavior on your Interact apps.